Seems as if we’re all busier than ever. With family, work and household chores, there’s little time left to keep your finances organized. Yet, if you don’t organize your finances then you might end up with unpaid bills, spending more than you earn, big credit card balances and a hornets nest of problems come tax time. Whether your net worth is in the three, four, five, six or seven digits, you still need to create a system to keep your finances organized. Budgeting – Formal or informal, you must make sure you have more money coming in than going out. Bill pay – Bill pay is the most frequent money task with most bills coming due monthly. Saving – Saving should also be a regular financial goal. Investing – Investing can be regular or periodic. Taxes – Taxes are due annually yet tax prep is a year round task. By tracking each of your financial accounts, you’ll get a good picture of your financial status or net worth, today. Ultimately, you want your net worth to increase. And that’s the goal of keeping your finances organized. You can start out creating your net worth or financial organization “big picture” by simply listing on paper or a spreadsheet the amounts in each debt, saving and investing category. Or, dive into a financial tool to keep your finances organized. 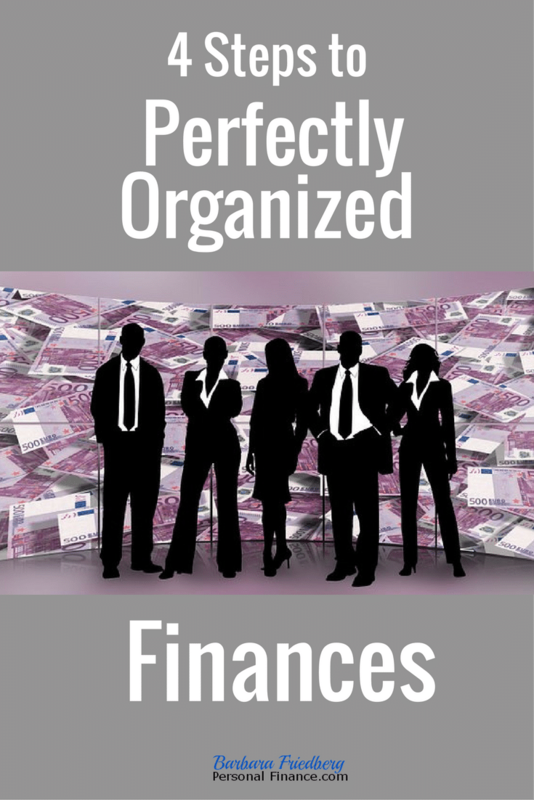 Let’s go through some of the best financial organization tools. Personal Capital Dashboard – This is my number one favorite if you have a net worth greater than a few thousand dollars. I’ve used the Personal Capital Dashboard for several years and the integration and updates are seamless. And, it’s free. After linking your accounts, fast, you have access to an amazing financial management toolbox; Account balance tracking, income and spending reports, investment check up and analysis including asset allocation view, investment fees, retirement planning calculator and net worth chart. Quicken – This is my second favorite way to keep your finances organized, predominantly because I’ve used it for decades. You buy the software and Quicken has a wealth of features and reports. I’ve used it to organize my budget, saving and investing accounts. Additionally, the reports are extremely helpful during tax season. I occasionally have difficulty downloading credit card transactions, unlike Personal Capital. Mint – Mint is also free, like Personal Capital, and best suited for those without large investment portfolios. Mint shines for budgeting and expense tracking. Mint also helps you create and manage goals and monitor your credit score. Mint also offers alerts, such as over budget notice and bill reminders. Unlike Personal Capital and Quicken, Mint lacks reports and top level investment features. 4. How Long Does it Take to Keep Your Finances Organized? As with anything new, set up takes some time. Each of the three financial organization systems takes some set up time. Personal Capital is the quickest with Mint a quick second and Quicken in third place. The simpler your current financial picture, the faster the set up. And accumulating more assets is a double edged sword. It takes longer to oversee a net worth of $2,000 than it does a net worth of $20,000, $200,000 or $2 million. When they come in the mail or your email in-box, put them in one place. I use a small file on my desk. For email, use a labeled folder. Schedule bill pay on your calendar. My mom pays them as soon as they come in, but that is inefficient! I called the companies to synchronize the due dates with our income. Thus, I pay bills monthly. You might want to pay bills twice a month if that’s when you get paid. To automate of not? You can schedule your bills to be automatically paid. The advantage is that it saves time and you won’t forget. The disadvantage is that you may pay less attention to the bill amount if it’s automated. I only automate my mortgage, a credit card and utilities. And I monitor the bill amounts. Set up “free bill pay” at your bank. First you set up all the payment details. After initial set up, you just log in, schedule payment date and amount and click send. For record keeping put the bills in a folder labelled receipts or paid bills. Place taxable bills, in a folder labelled taxable expenses. Or just keep an e-file on your computer. I know I’m going to get some flack for this; especially from those of you who check their net worth monthly or more frequently. I recommend updating your investments quarterly or less frequently. With the automated systems, its easy to download financial asset prices dividends and interest. In fact, John Bogle, founder of Vanguard Investments once said that if you’ve set them up properly, you don’t need to check your investments until retirement. Although I think that might be a bit extreme. Nevertheless, if you’ve set up an asset allocation and automated your investing, then there’s no need to worry about investment values. You understand they’re going to vary and you don’t want to over-react to the normal market ups and downs. Just to keep your records clean, update your investment accounts 4 times or less per year. Annually, you may want to rebalance your investments back to their original asset allocation. For tax purposes, keep a copy of all buy and sell transactions in a secure location. Personal Capital and Quicken reports can help with this record-keeping. Download banking transactions once or twice per week to check accuracy and balance. If you don’t use a debit card much or make a lot of withdrawals, check less frequently. Reconcile your account monthly. Quicken reconciles the account on-line in seconds and Personal Capital keeps the accounts updated every day. When tax related items, W-2’s, 1099’s etc. come in during the beginning of the year, place them in a file. If you do your own taxes it’s useful to use a tax prep program. Many programs import required information from an automated system such as Mint or Quicken. Depending on the complexity of your situation tax prep could take from a couple of hours to a few days. If you hire a tax preparer. Take your tax related income and expenses list to your tax preparer. Make sure to check the preparer’s work for accuracy before you send the return to the IRS. Keeping your finances organized is a housekeeping job that is an inconvenience, yet ultimately makes your life run smoothly. If you’re looking to build wealth, you need to prioritize ways to keep your finances organized. And while you’re at it, set a few financial goals. It’ll keep you motivated towards financial security. *Disclosure: Please note that this article may contain affiliate links which means that – at zero cost to you – I might earn a commission if you sign up or buy through the affiliate link. That said, I never recommend anything I don’t personally believe is valuable. Start small, just do one step at a time. Every time I have a receipt I would like to save for my taxes, I put it in a tax folder. I sort my paycheques and credit card bills in each envelope and sort them chronologically. I do a “net worth calculation” every month to make sure all my investments are still performing as they should. Great post. I have my bills automatically deducted, so I have to make sure I check my on line account at least weekly to make all the proper credits. I also put all tax receipts immediately into my tax folder for that year. I have gotten a bit behind on my investments lately. I need to really look into the system for that. I have coordinated my bills within a 2-week time frame, so most of them are due around the 1st and the 15th. That way I don’t have to worry about paying bills more than a 2 to 3 times per month. As for checking my balances and investments, I’m probably checking my bank balances too frequently, and my investments too rarely! I like to centralize all my accounts if possible. I also use electronic payment (cc or debit) 99% of the time in order to easily track where the money is going. All you need is excel and you’re set to micro-manage every dollar if you so wish! @Beating-Centralizing your accounts is very EFFICIENT. Sounds like you are on top of things. Thanks to all for sharing your strategies! Bill Pay and E-Bills are a Godsend. I spend way less time with envlopes, checks and stamps now. It’s the only way to go. I also recommend automtic investing. If you have a steady paycheck that is direct deposited, you can easily setup automatic investments into a brokerage account or a mutual fund. Also eliminates missed payments and forces “wealth building” through automatic investing. YOu will be amazed at how the invested money grows over time. Good summary and techniques for getting organized. Thanks! In addition, it can be a good idea to re-balance investments once a year to keep the proper asset allocation. If stock portion has grown too large, sell some and invest in bonds or other categories. Hi Robin, Rebalancing your investments is definitely a part of keeping finances organized. I like that you mentioned doing that task once per year. Althoug others discuss rebalancing more often, there really is no need. Thank you for bringing up this important task. Happy to help. Glad you liked it. I use Geltbox money app. http://www.geltbox.com no need to give personal financial information to any third party.